The theme for the fourth week of the Poor People’s Campaign focused on environmental justice and healthcare. A common tactic used this week was the die-in because of the focus on the right to a healthy life and planet. The die-in tactic was used inside buildings, outside buildings and even on the Olympia lawn for a house owned by Shell Oil lobbyists. Two states also covered up statues for the first time in the campaign. California covered up the statue of Christopher Columbus inside the Capitol, while Alabama covered the outside statue of Jefferson Davis. Arrests this week took place in D.C. (28) and 18 states, including Pennsylvania (31), Michigan (29), New York (27), Massachusetts (21), Tennessee (18), Kansas (16), Washington (16), New Jersey (15), Missouri (14), California (13), North Carolina (13), South Carolina (13), Ohio (9), Alabama (7), Indiana (6), Maryland (5), New Hampshire (4) and Arkansas (3). This is a total of 288 arrests for week four. At the end of week three there was 1,059 arrests total, after 475 arrests in week one, 337 arrests in week two, and 247 arrests in week three. There were more arrests in week four than in week three, which is the first time the amount of arrests has gone up from the previous week. The 288 arrests in week four combined with the 1,059 arrests results in a total of 1,347 arrests for the first four weeks of the campaign. After having no arrests last week, Pennsylvania quickly became one of the relatively biggest arrests for the campaign (only D.C. and two other states, Missouri and North Carolina, broke over 30 arrests so far in the campaign). This marked the first week that a state had more arrests than D.C. did. 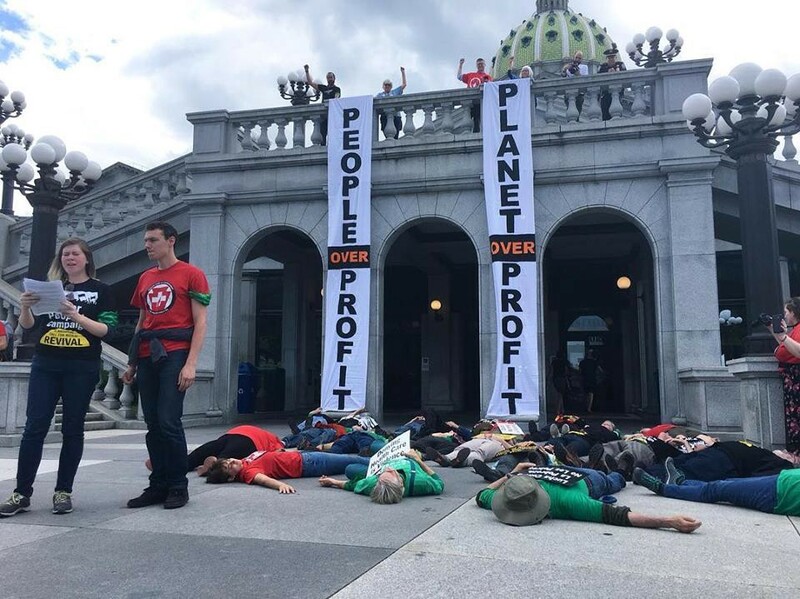 Penn Live reported that 31 people were arrested outside the back Capitol door entrance for performing a die-in on the cement for half an hour, as two banners were dropped in the background that read: “People Over Profit” and “Planet Over Profit.” Earlier that day about 200 people attended the rally in Harrisburg. Co-chair of the Poor People’s Campaign Rev. 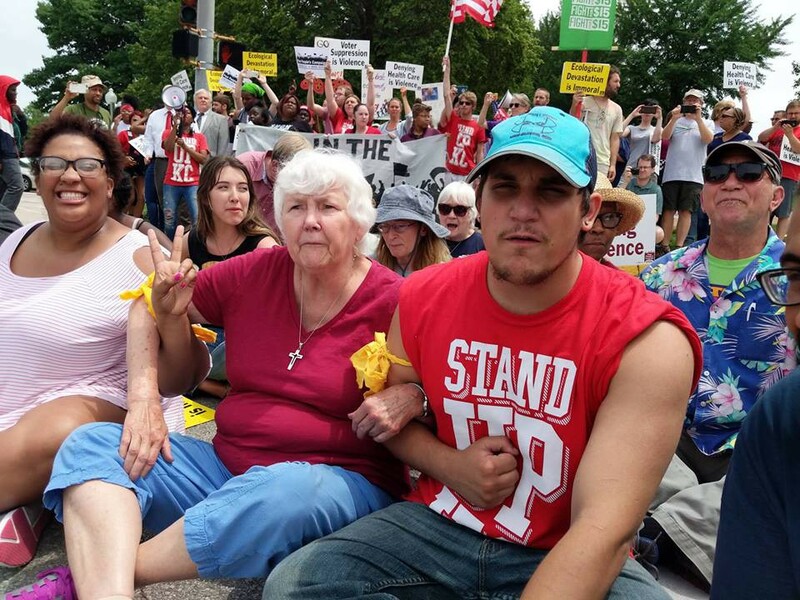 Liz Theoharis, a Michigan native, protested in Michigan this week, after having been arrested in D.C. the previous three weeks. Her presence boosted the attendance of the rally to 500 people and 29 were arrested. They rallied on the Capitol steps and then held a people’s trial of Republican Governor Rick Snyder, who was represented that day by someone wearing a big paper-mached head and a black and white prison uniform. The trial was held on South Capitol Avenue in front of the George W. Romney building, and was declared guilty of multiples crimes such as shutting off water to Detroit houses. 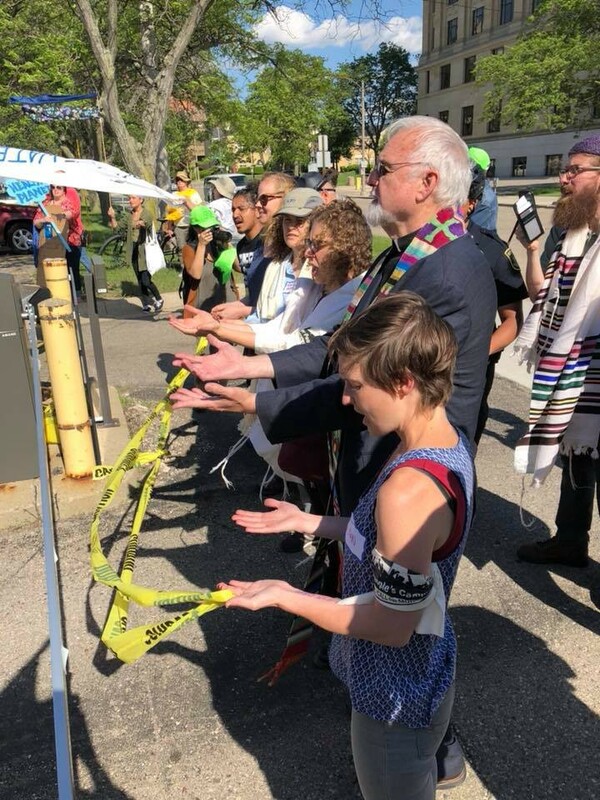 By 4:00 P.M. the large crowd arrived at Michigan’s Department of Environmental Quality housed in Constitution Hall, and activists creatively used over 6,000 feet of yellow caution tape to circle Constitution Hall. This was symbolic and did not actually prevent people from leaving the building, and some people exited the building upset and one older white woman cut the cautionary tape. At different points the entrances to the building were physically blocked, as were the parking lot exits of employees leaving the building on West Washtenaw and West Allegan streets. Marching into the Capitol Rotunda Monday afternoon while attempting to deliver letters to Republican House Speaker Paul Ryan and Senate Majority Leader Mitch McConnell, at least 28 people were arrested by Capitol police. About 120 people rallied on the Capitol lawn earlier that day. 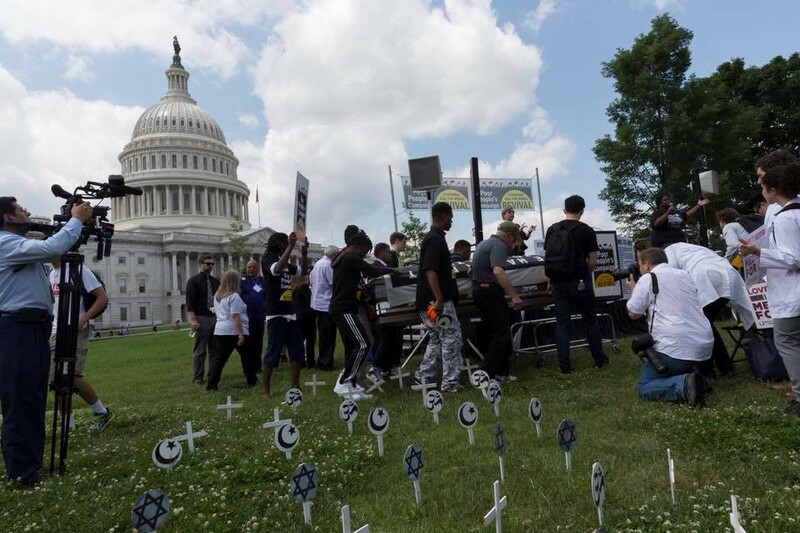 Protesters carried a “wooden casket” with a Poor People’s Campaign banner laid on top to the East Front of the Capitol lawn, where they also “planted grave markers,” as reported by Roll Call. After the rally they marched to the Rotunda to deliver the letters, but they were denied a meeting, and chanted and sang in the Rotunda until they were arrested. The group was also ordered to remove the casket from Capitol grounds. Western Mass News reported 21 arrests at the Springfield State Office Building, after dozens rallied in downtown Springfield at Court Square. Activists said Springfield was recently labeled the most challenging in the county for those who have asthma. 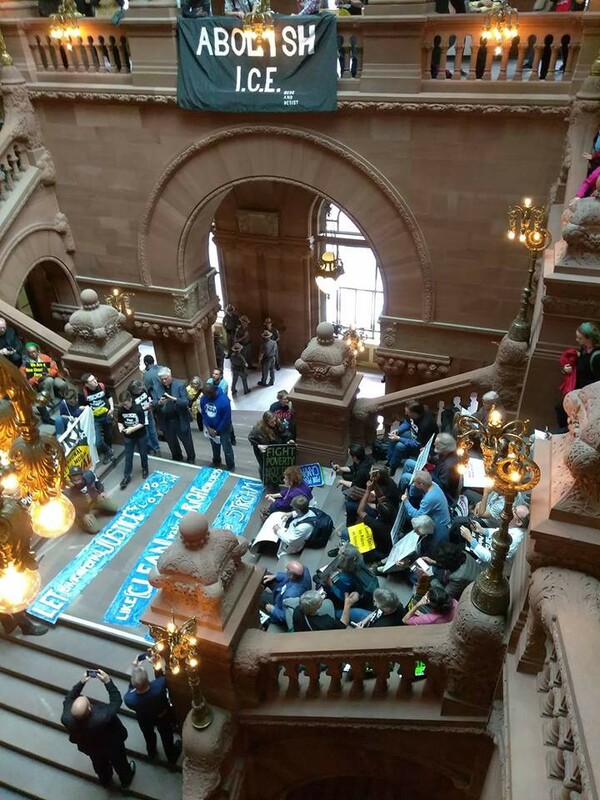 Activists entered the State Office and did a sit-in blocking the front door outside as well as an office door inside. 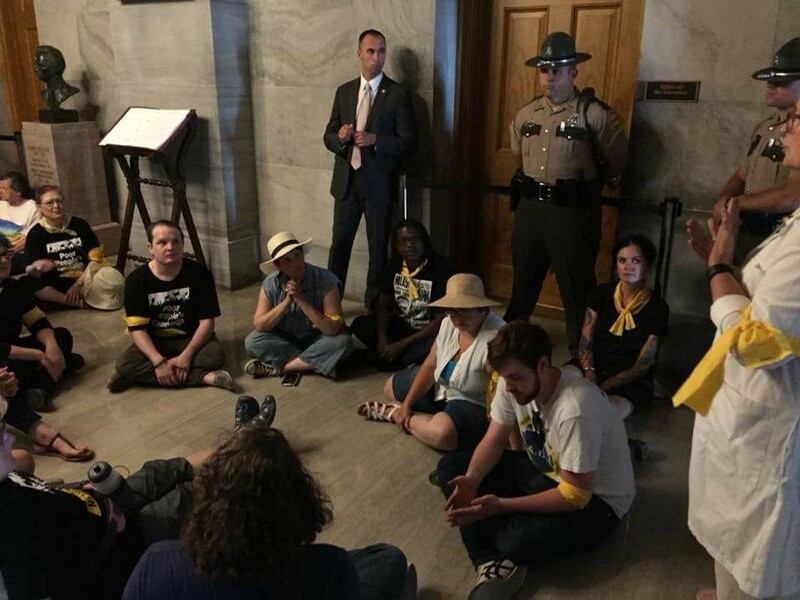 The Tennessee Poor People’s Campaign engaged in civil disobedience for the first time inside the Capitol Building, having performed civil disobedience outside all the previous weeks. They planted a vegetable garden on the Capitol lawn and then entered the Capitol asking for a meeting with Republican Governor Bill Haslam. 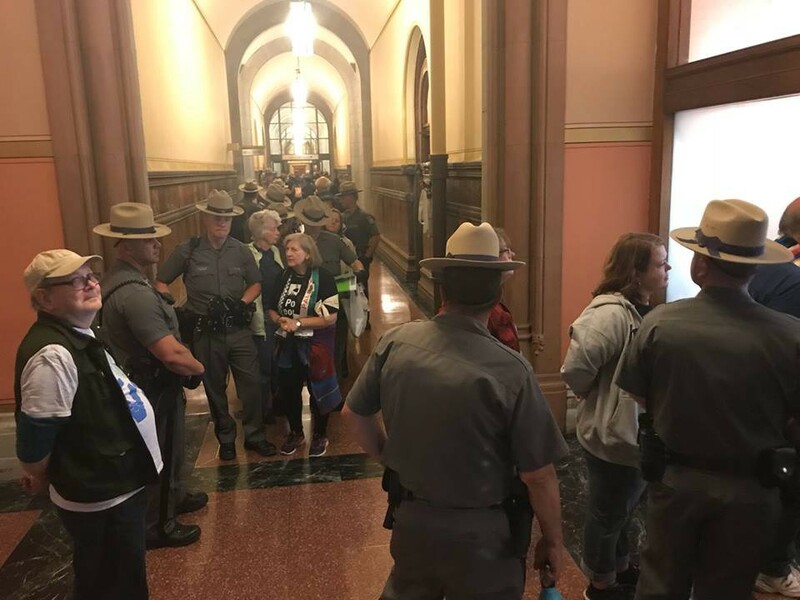 Doors were locked as the group walked down the hallway, and when they reached the Governor’s office they found the doors shut and guarded by troopers. The protesters were told a representative from constituent services would come talk to them. They sat down and waited, but no one came, and eventually 18 of them were arrested. Organizers said the Governor was seen leaving the building after the action. 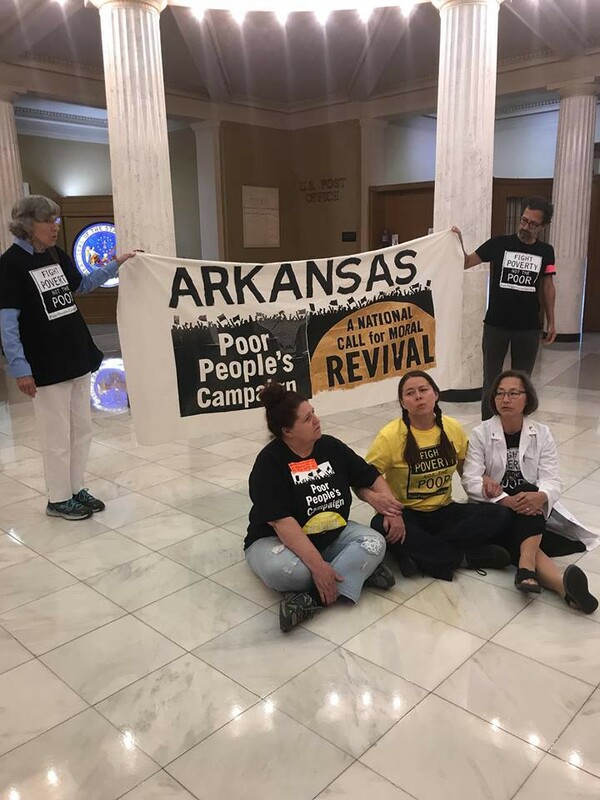 After the rally inside the Capitol Rotunda, 16 protesters did a sit-in and were arrested outside the door of Republican Governor Jeff Coyler’s office. Unable to enter the locked doors, protesters initiated a sit-in outside the door and were warned to leave the area. When they refused 16 were arrested and charged for criminal trespassing after violating their permit to hold a demonstration inside, a misdemeanor. The Governor responded later in a written statement: “Governor Coyler appreciates the advocacy of the protesters today, however he continues to support work requirements for able-bodied adults on government welfare programs and opposes the expansion of Obamacare in Kansas.” The Topeka Capital-Journal wrote that the arrests happened shortly after 3:00 P.M., and that many continued singing as they were arrested and led away. WIBW News Now reported that they were booked at Shawnee County Department of Corrections. 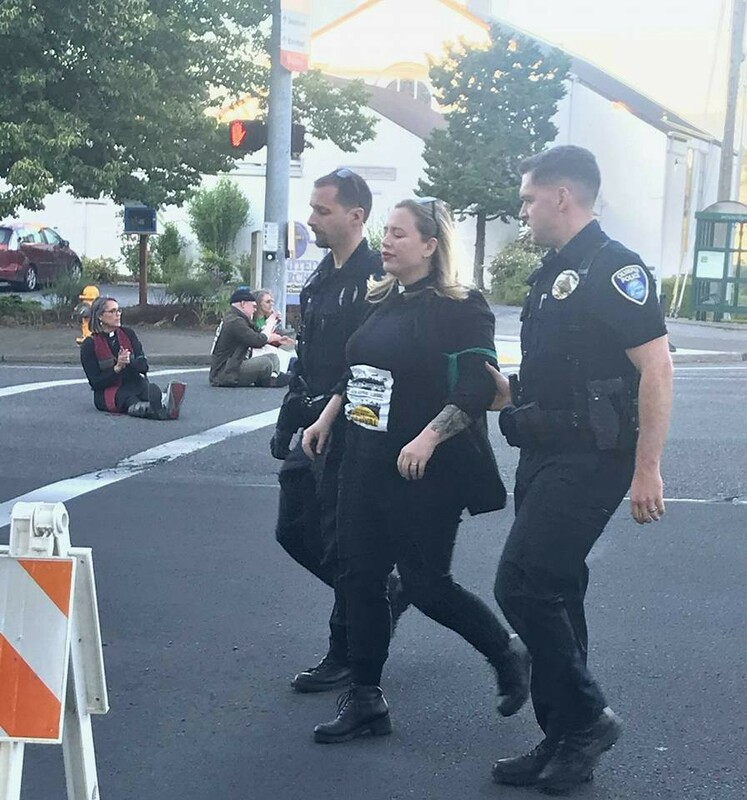 About 16 people were arrested for blocking an intersection in Olympia, Washington. As of this writing there has been no news coverage on it, but Washington Poor People’s Campaign has a Facebook video of the sit-in and arrests. 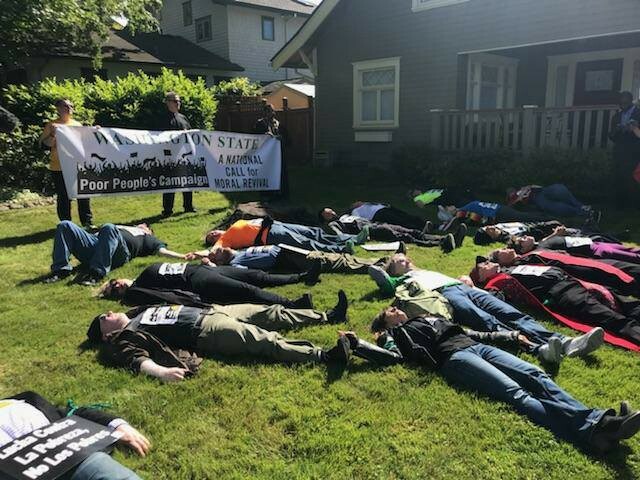 Another die-in was carried out that day in Olympia on the lawn on a house owned by Shell Oil lobbyists who wine and dine Washington politicians. 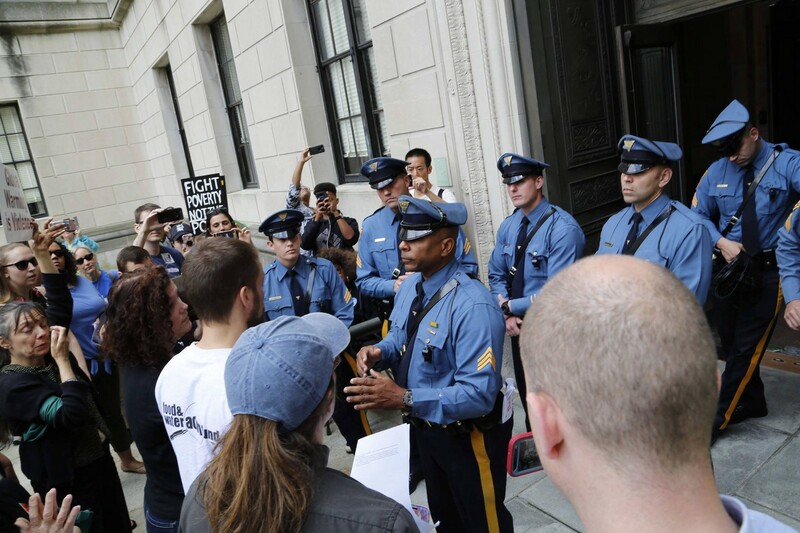 Two actions coordinated by the New Jersey Poor People’s Campaign took place in Trenton and resulted in 15 arrests. 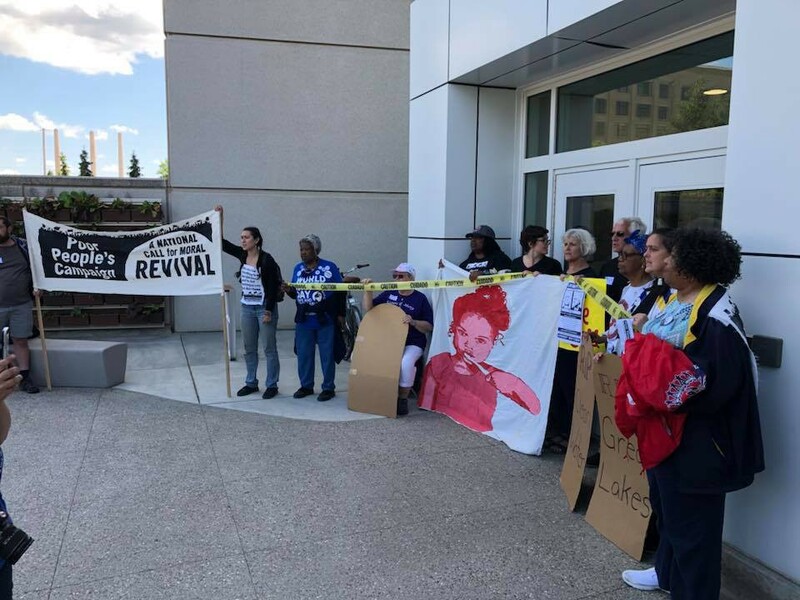 The week before Poor People’s Campaign members were prevented from entering the State House while carrying a letter for Democratic Senate President Sweeney, and seven were arrested. This week they were once again prevented from entering the building for a public meeting with Sweeney. “Let Us In” was chanted by protesters hoping to meet with Sweeney over the Democrat-controlled state Senate’s failure to introduce a budget that included a Millionaires Tax to help the 1 million people living below the poverty line in the state. 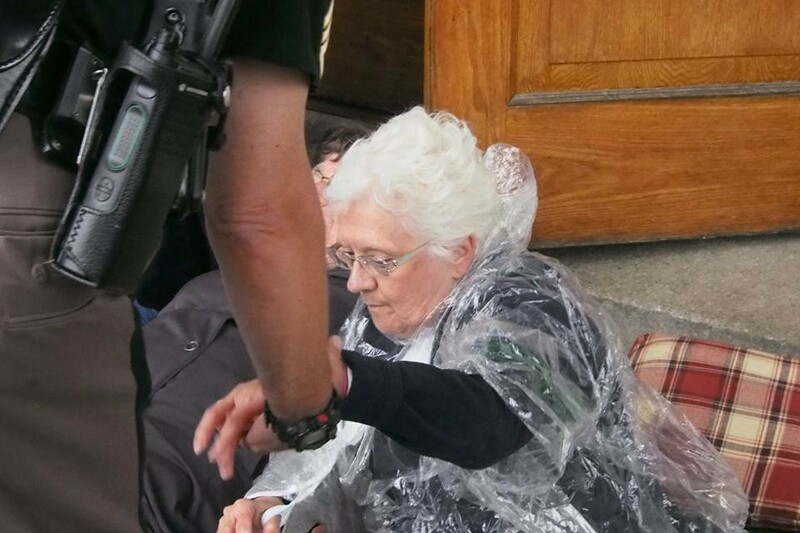 Eventually 10 people were arrested for attempting to enter the People’s House. 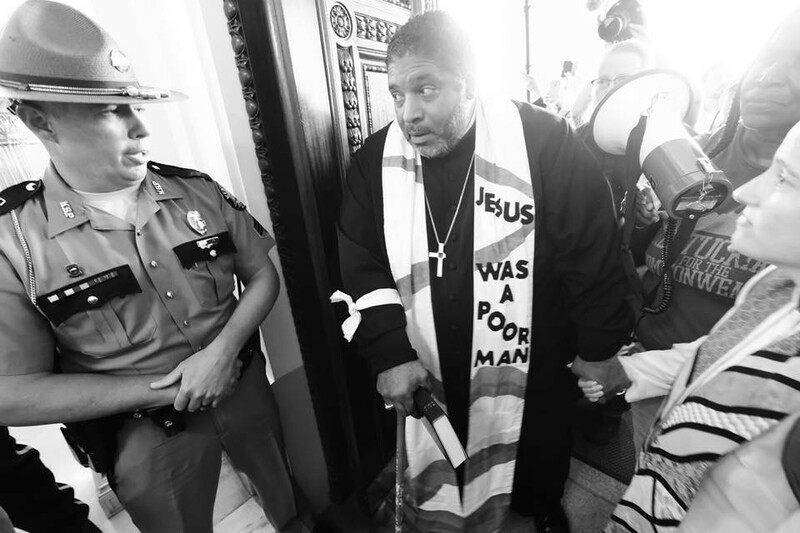 As people rallied outside, a second group of faith leaders and others disrupted the Senate Budget and Appropriations Committee Hearing inside the State House. Five people were arrested for standing up and reading a letter demanding President Sweeney to introduce a moral budget. Among those arrested inside was Reverend Alison Miller of the Morristown Unitarian Fellowship. For the fourth week in a row arrests took place in the streets of Jefferson City. The day began with a rally outside the Capitol Building, with speakers like president Carol Smith of the Missouri Rural Crisis center, who noted how pollution from power plants disproportionately impact neighborhoods where minority families reside, while healthcare advocates decried Missouri’s failure to expand Medicaid. 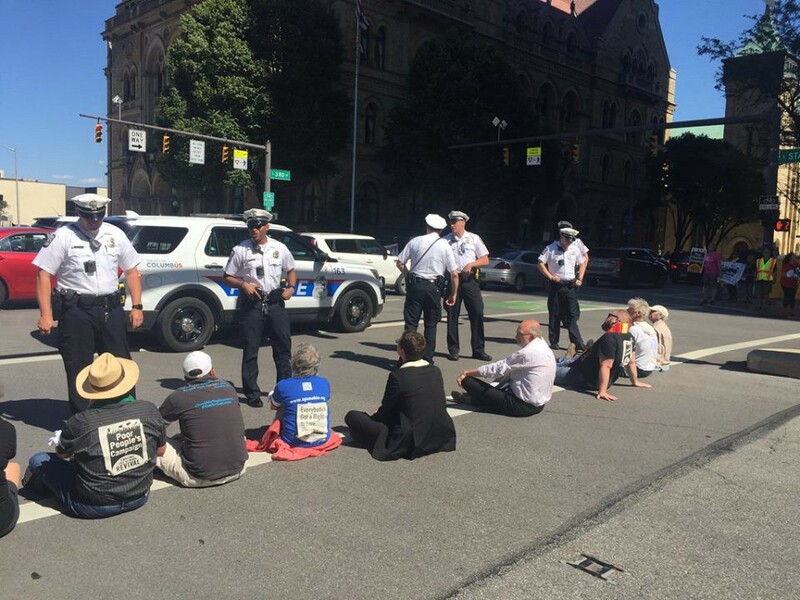 The Jefferson City News Tribune wrote that Jefferson City Police officers “cited about a dozen people,” but organizers clarified that 14 people were cited for blocking traffic at the intersection of West High and Broadway streets. Parachute unfolding in Sacramento, June 4, 2018. 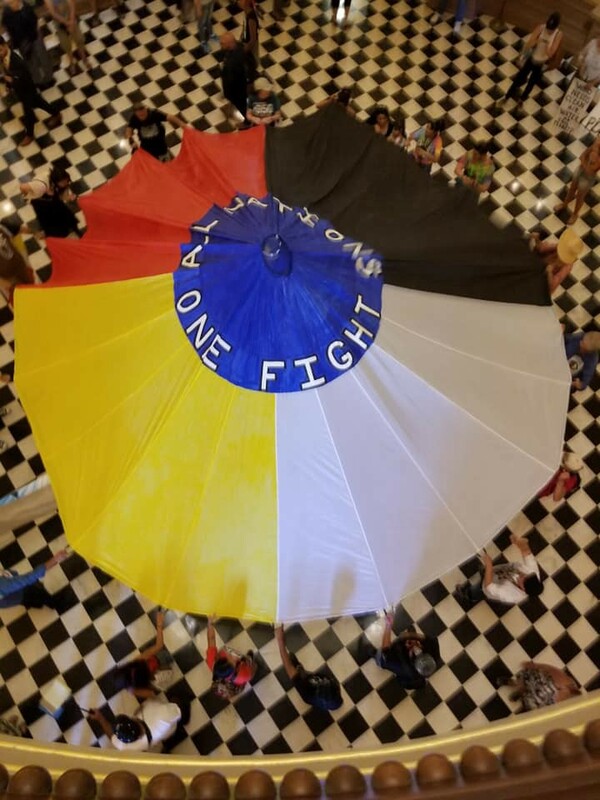 Sacramento witnessed a colorfully creative action inside the State House targeting the Christopher Columbus statue in the Rotunda. Activists laid out a massive, multi-colored parachute across the room and some crossed a rope surrounding the Columbus statue and hung a sign on it. The Sacramento CBS wrote that officers started making arrests shortly after activists started to climb on the statue. They face charges of resisting and delaying a police officer, disobeying a lawful order and vandalism. The activists arrived by 9:00 A.M. but were not arrested until 6:00 P.M., wrote KCRA. California Highway Police reported that activists only had a permit for outside and not inside. KCRA wrote that this makes a total of 51 arrests in Sacramento throughout the campaign. Kyle Moore and others risking arrest in Raleigh, June 4. 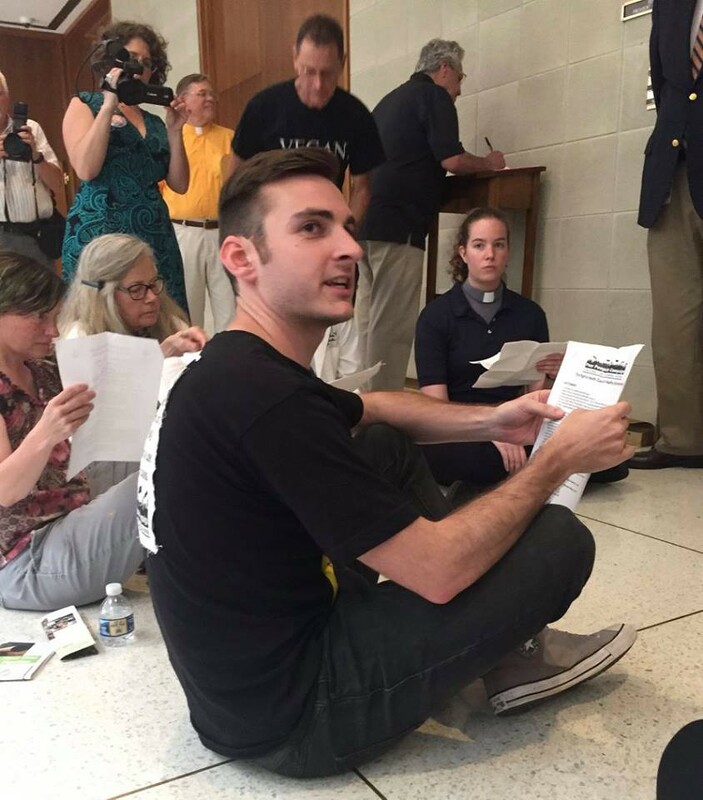 In Raleigh, North Carolina, 13 of us were arrested inside the Legislative Building for performing sit-ins. About 150 people attended the rally outside at the Bicentennial Plaza, with speeches from patients and doctors. 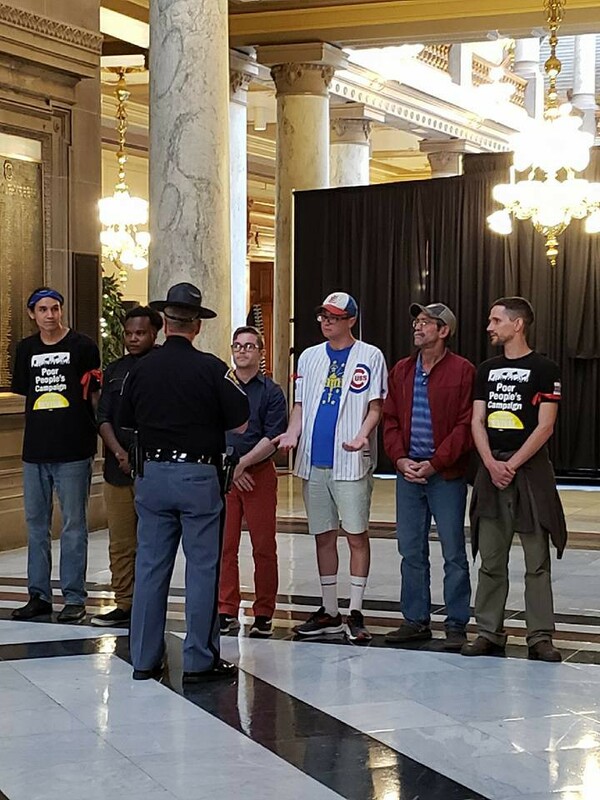 A police official at the General Assembly told the Associated Press that 13 people were arrested for performing two sit-ins simultaneously outside the offices of House Speaker Tim Moore and Senate leader Phil Berger. This same action was taken against both offices during week two in Raleigh, also resulting in 13 arrests. After an alleged noise complaint all 13 were charged with second-degree trespassing. The seven women and six men ranged from the ages of 27–84, with an elderly bent (I was the youngest male arrested at 27, but the next oldest male was over 60). The Associated Press calculated a total of 87 people have been arrested in Raleigh since the campaign launched (it is actually 88 arrests, but during week three the press mistakenly claimed 12 were arrested when it was actually 13). In Columbia, South Carolina, 13 people were arrested for blocking U.S. Highway 1 in front of the capitol. Earlier that day, according to the Associated Press, there was a rally attended by about 120 people and a lie-in where two dozen people laid on the ground (the term lie-in easily goes back to the 1960s, whereas the term die-in wasn’t really used by the press until the early 1970’s during the Vietnam protests). 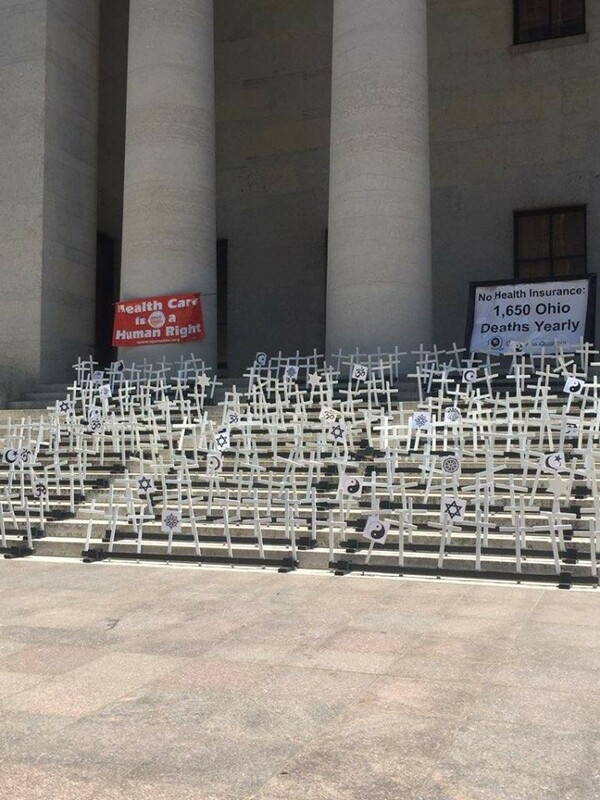 The lie-in took place inside the building for 7 minutes and 30 seconds, with each second representing one person who died due to the state not expanding Medicaid. Due to South Carolina’s draconian punishment for trespassing in the government building they left the building and shut down traffic. Those arrested were holding two signs: “Deaths Runs the State House” and “Our Blood Your Hands!” Columbia minister Charles Rhodes was among those arrested by Columbia police. Possibly seven people were arrested in Montgomery, Alabama, but for the second time there has been no press coverage on one of its action. The action of June 4th was aimed at Jefferson Davis, who the state of Alabama honored that day by continuing the tradition of declaring the first Monday of every June a state holiday in honor of his early June birthday. Therefore all state offices were closed that day and activists could not do an action inside. Instead, they covered up the statue of Jefferson Davis that sits outside near the Capitol Building on the corner with a massive white banner (see video of banner here). The activists then stood by the statue and made remarks, clearly proud of their work, and then they were arrested and handcuffed right by the statue. Six individuals were arrested at the Capitol Building in Indianapolis, but as of now there has been no press coverage. For the fourth week in a row arrests happened in Annapolis. Similar to the other weeks it began with several dozen protesting at the Lawyers Mall outside, and then people entered the State House to begin the direct action. Also like previous weeks, security strictly enforced that no one arrested previous weeks could enter, one of the few states enforcing this so harshly. The Baltimore Sun wrote that the “arrests occurred in a businesslike manner, with no signs of hostility on the part of protesters or police.” Five activists stood near the base of the steps that lead to the Governor’s office and read out a series of grievances in a shouting manner. They sat down on the marble floor and continued to chant as the Maryland Capitol Police Chief warned them they would be arrested if they didn’t stop, but they continued and they were led away in restraints to police vehicles right outside, as protesters chanted in support from the State House steps. A Capitol police officer said the five were charged with refusal or failure to leave a public building and failure to obey a reasonable and lawful order. They were released after signing their citations. 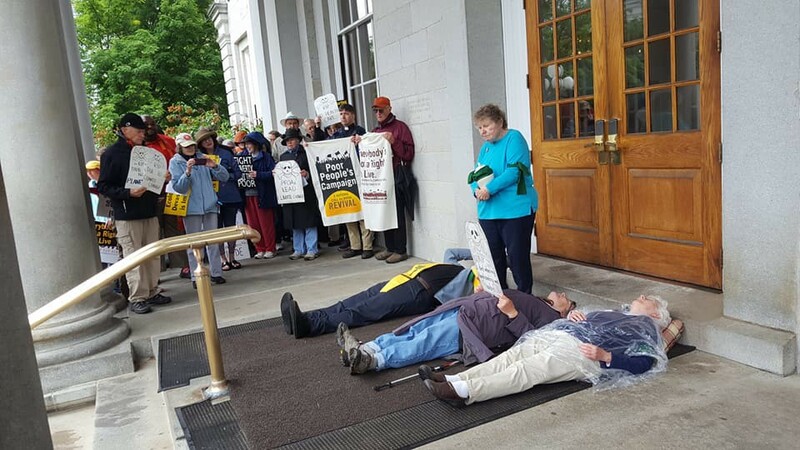 In Concord about four people were arrested when they performed a die-in and held cut-out gravestone signs above them in front of the doors of the State House during the cold, rainy day. By 8:00 P.M. they were released from the Merrimack County Jail (Twitter photos of arrests can be seen here). As of now there has been no news coverage of the action. At least three individuals were arrested in Arkansas, but the action received next to no coverage. Those arrested were taken to the Pulaski County jail and released at 10:00 P.M. This week both Rev. Barber and Rev. Liz Theoharis left D.C. and boosted momentum in Kentucky and Michigan, respectively. Despite Barber’s presence in Kentucky, however, no arrests took place. This is because Kentucky has had zero arrests during the whole campaign and police seem keen on keeping it that way. In week two the police went as far as allowing 16 protesters stay in the Rotunda overnight rather than arrest them for trespassing. And it was because of this Rotunda sleep-in during week two that police justified their exclusion from Rev. Barber and the hundred people trying to enter the Capitol Building. 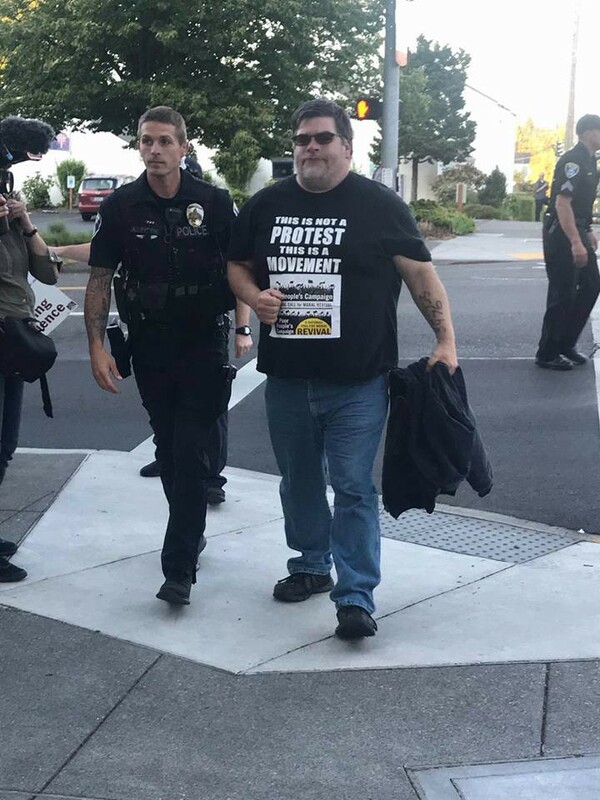 Ever since the overnight action police claim to only allow two protesters in at a time, and would allow two more people in once those other two people exited the building. Rev. Barber called this “fascism” but was unsuccessful trying to wedge through the police blocking the door. The Poor People’s Campaign will without a doubt be the largest campaign of civil disobedience in the 21st century. The Keystone XL Pipeline protests in D.C. a few years ago were estimated to be around 1,200 arrests and for a brief time was the largest civil disobedience campaign in the 21st century. Democracy Spring and Democracy Awakening would break that record in April 2016, when about 1,300 people were arrested for seven days in D.C., including Rev. Barber. Right now the Poor People’s Campaign is at 1,347 arrests, probably right around Democracy Spring’s record, but Poor People’s Campaign has two weeks left and will easily take the record of most arrests in the 21st century. This will most likely not beat the U.S. record of most arrests, when over 13,000 were arrested in three days in D.C. against the war in Vietnam in May 1971. The Poor People’s Campaign sights will most likely be on trying to reach 2,000 arrests.